In previous part 5 of this series, we have explore the educational email types of email designing for your email marketing campaigns. Now, in this part I would like to introduce you with the business event-based and personal occasion-based email marketing and email designing. In traditional and modern businesses many events take place such as conferences, seminars, product and services unveils, presentations, and webinars. Most of them are local and involve physical participations, while in case of enterprises they are global and involving big audience. Virtual events are not exceptions here. Therefore, we need run event based email marketing to make our events successful. However, event driven email campaign is differing many ways from the rest of email marketing types because unlike regular email marketing we need not to crafts the emails before and send them to selected groups of recipients with a schedule. 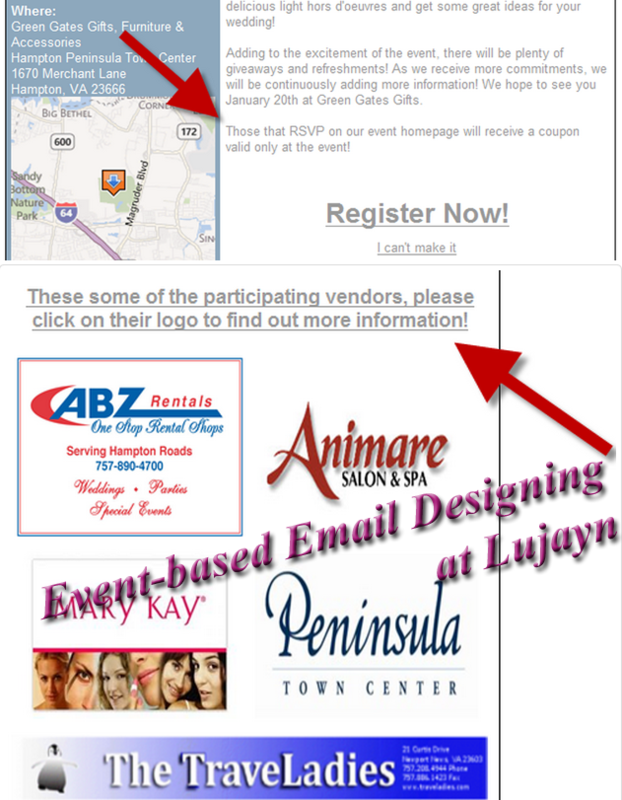 In event-based email designing, we have to announce first our events loudly. Afterwards, invite people to register proactively. Thus, we can know who is arriving and how as well as for which purposes at business side. Whereas recipient may know, which brands inviting them and what they will get there, along with incentives offered by various brands in a big participation event. Since the data of participants or invitees should collect dynamic ways using websites or emails themselves, our tech job is increasing heavily in case of event driven email campaign. As we have to add, database related actions in emails and corresponding websites at designing and programming levels, and the whole campaign becomes a trigger-based email design with adequate knowledge of latest scripting including mobile technologies. This is again differing from the business event-based email campaigns and falling in traditional types as this kind of email need a list of subscribers so we can select them to shoot our emails. Due to stiff competitions in the market, each business have to keep itself on the top of their visitors and patrons using various marketing and goodwill building techniques. Wishing birthday or anniversary event of subscribers on time bases may help you a lot for long run. Lujayn is using pre-collected data of the website visitors and subscribers or previous customers to know their birthdate, marriage, marriage anniversary, and other such delightful events of their personal lives to shoot such emails. Expert email designers or web designers know how to decorate their email in contexts of the personal occasions or events and offer appropriate good wishes. Moreover, they offer various gifts through various Internet marketing techniques and keep the memory of brands alive in the minds of people once interacted with them. However, gathering birthdate is easy through signup process, but marriage and anniversary events dates need extra efforts using social media sites. Since we are web and mobile designing company, we have enough expertise to collect recipient data efficiently and rapidly through your website/web application or mobile apps. Thus, you need not to go elsewhere and spend extra bucks on your event driven email campaigns. Our event email templates or custom designs allow you to setup event emails as per your needs so you can make announcements, registrations, confirmations, and reminders for your particular events with unique names and designs. We permit you to modify existing event emails campaign for new relevant events. As we know that very few modifications make previously used email templates viable for new events too. Therefore, we design you emails such cost-effective ways. We allows you to collect and select unique email recipients for your event email campaigns. We include many features for event organizer body friendly manners so event organizers can include their details and dynamic buttons to know the choices of participants upfront. Moreover, they can get relevant copy of responses coming from the recipients through proper email routings. We allow you to schedule your event emails dispatch in smart and selective/personalized manners so you can send your emails before events and leaving enough time gaps to prepare participants. Finally, we offer great analytics abilities to your event email campaigns through inclusion of latest and appropriate email analytical tools. What need you more now? If anything specific to your business, please fill up our enquiry forms and get quick response for your email or relevant web designing needs.